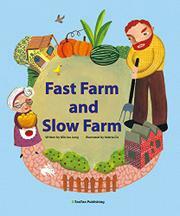 The methods of two neighboring farmers pit chemical agriculture against naturally grown food. Thump-Thump Giant raises produce quickly, utilizing a shed full of pesticides and herbicides. He fattens his cows and sheep with chemical-laced feed. Nearby, Grandma Snail raises her crops and animals without chemicals. She works harder than Thump-Thump Giant but shines with confidence in her food’s superior flavor. The farmers sell at side-by-side stands. Both draw customers but for different reasons. The giant’s robust food is cheap, while Grandma Snail’s is both imperfect and delicious. She sells out her crops, but Thump-Thump Giant always has unsold produce left over. The text crams the history of industrial farming into Thump-Thump Giant’s modus operandi. He sprays pesticides on his leftover food, intending to sell later. He packages heat-and-serve, preservative-laden meals for busy people. His Ready Meals are a hit until people sicken from eating them. Grandma Snail, meanwhile, writes a guide to growing and cooking natural foods and shares her farming knowledge with visitors. The didactic narrative is thick with stilted, over-the-top dialogue. “My child got a skin disease after eating Ready Meals!” one customer shouts. “I feel bloated and have indigestion,” another says. At Slow Farm, a diner avows, “I taste the refreshing and sweet flavor of fresh vegetables the more I chew.” Thump-Thump’s predictable reformation follows; pleasantly folk-style depictions of a diverse community elevate the package.